Aung Htay played quality game since the start and took early lead crafting breaks of 95, 191, 98 but in midway, Siddharth’s breaks of 118 and 157 points brought him close. 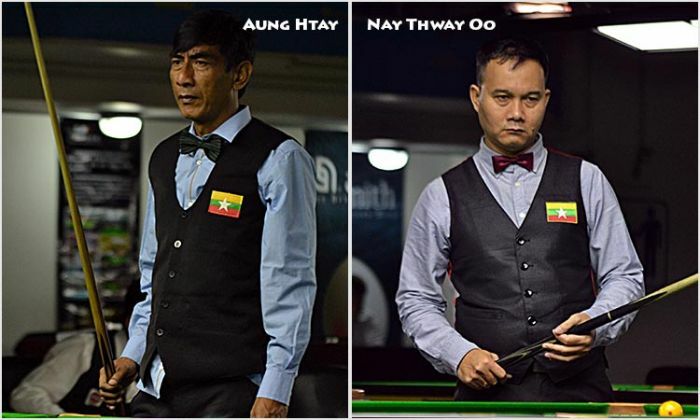 Seeing ahead the danger, Aung Htay increase the pace and crafted couple of small but effective breaks to keep up his lead. However, Siddharth once again tried to narrow down the deficit crafting break of 95 points, but not that enough to surpass Aung Htay. Lastly, Aung Htay secured the win by 63 points to see Mike Russell in Quarter Finals. Another player from Myanmar, Nay Thway Oo marked a big dent in Indian camp by sending back former World Champion Rupesh Shah from last 12 stage. He beat Rupesh by 195 points. Nay Thway was in commanding form and made four century breaks (138, 113, 114 and 106) during the match to knockout Rupesh. Though Rupesh tried his best to counter him with breaks of 81, 67, 137 and 99 but Nay Thway Oo was too quick to close the proceedings leaving Rupesh behind. Nay Thway will now meet another Indian player and Seed 3, Dhruv Sitwala in Quarter Finals.